Author Alexander Bennett is the ultimate insider--holding multiple black belts in Kendo and Naginata, as well as a Ph.D. in Japanese literature and history. In this book he shares his vast personal experience and knowledge with readers seeking to undertake their own personal quest in the Japanese martial arts. Bennett outlines the Japanese history of Bushido and the Samurai--from early times up until the present. Then, as only someone steeped in this world can, he surveys the contemporary martial arts scene and provides the essential knowledge young foreigners need to find a teacher and learn successfully. 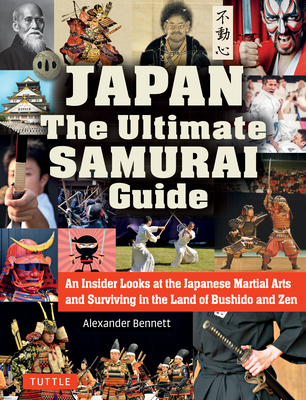 Unlike any other book on this subject, Japan The Ultimate Samurai Guide is written by a Japanese speaker who has studied and taught martial arts in Japan for many decades. Written in a down-to-earth and easy-to-read style, this book will captivate anyone interested in Japan, as well as martial arts teachers and practitioners around the world. With both history and humor, this vividly illustrated book has a more personal touch than many (for example, read up on "Fifteen Famous Japanese Cultural Indiosyncrasies" and Bennett's favorite martial arts movies). As Bennett says, "This book is supposed to be genuinely from the heart. Without the pretense...misconceptions or romantization that often accompanies martial arts. Alexander Bennett first came to Japan from New Zealand in 1987 as a 17-year old high school exchange student. On a whim, he decided to try his hand at kendo even though he had never seen it before, because it looked "cool," like something out of Star Wars. Overcoming the initial language and cultural barriers, he survived many ruthless training sessions meted out by the club's sensei--and yet the more he learned, the more he sensed that there was so much more to Budo than meets the eye. Acutely aware that he had merely scratched the surface, he soon returned to Japan at the age of 19 to embark on a "spiritual journey" of personal discovery. Bennett has since immersed himself for the past 25 years in the world of Budo--the traditional Japanese Martial Arts. He holds the black belt grades of Kendo Kyoshi 7-dan, Iaido 5-dan and Naginata 5-dan. He has competed successfully in many international naginata and kendo competitions, taking second place in the World Naginata Championships in 2011, and best 8 in the team event at the World Kendo Championships in 2012. He co-founded and serves as Editor-in-Chief of Kendo World, the world's first English-language journal dedicated to kendo. He has received two doctoral degrees in Japanese literature and history from Kyoto University and the University of Canterbury (NZ). He is currently Associate Professor at Kansai University where he teaches courses in Japanese history, martial arts, and Budo theory. He is Vice President of the International Naginata Federation, International Committee Member of the All Japan Kendo Federation, Director of the Japanese Academy of Budo, and he represents NZ Kendo as the Head Coach.